Note: this is part 02 of my Permaculture Survival Guide, in case you missed out on part 01 you can find it here. Just a heads up, this is a pretty long post so if you don’t have time to read it now, you can download the PDF e-book here. Do you ever wonder what the future might look like in 10, 20, 30 years? I mean, when you think about it, virtually everything we take for granted today is on an unsustainable trajectory. 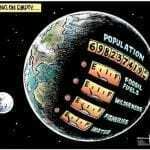 Isn’t it inevitable that anything unsustainable must end someday? You might decide to ignore this fact, and pretend that everything will sort itself out but, sooner or later, no matter how hard you try, the reality hits you in the face and you’re forced to do something about it. Now, maybe we don’t know exactly how all of this is going to end, but it most certainly will, and we have to accept that there is the likelihood for some huge societal changes when it does. As I concluded last time, history teaches us that complex societies living beyond their means don’t collapse overnight; rather they experience a slow and enduring decline. This collapse is triggered and accelerated by disruptions, transformational events (think 9/11, the Financial Crisis of 2008, Hurricane Katrina) that, in their aftermath, shape society in the years to come. In this post, I’m going to look at these potential disruptions and how our society is likely to change in the wake of these emerging new realities… but I’ll also talk about how you can set up your farm in preparation so you’re well able to withstand the events to come. Ok, so a lot to cover here, let’s dive in! For the time being, energy shortages don’t seem to pose an immediate threat to our societal progress and complexity. We have a modestly increasing energy supply via the extraction of unconventional fossil fuels and we definitely believe that there is much more where it came from. So, as of writing, energy is not a pressing concern despite the vast bulk of the world’s oil production having peaked and going into decline. 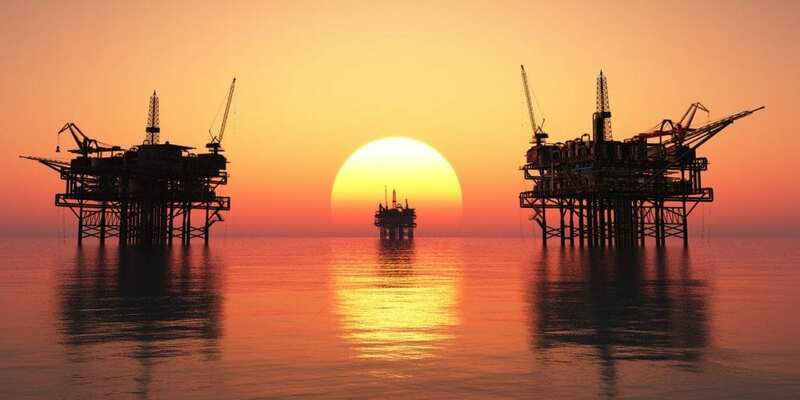 However, unconventional fossil fuels are no answer to peak oil, they merely sustain the supply for the time being but at a huge environmental cost. In addition, given the terribly low energy profit ratio (EROI) these fuels offer, to maintain these highly complex operations requires a financial system capable of providing copious amounts of affordable capital. 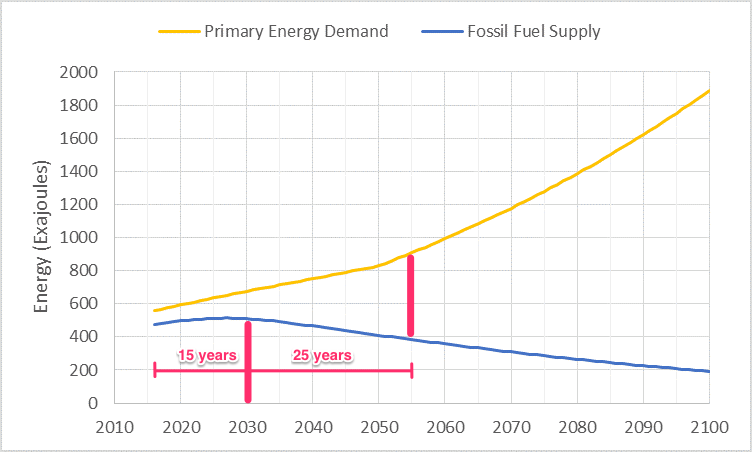 As you can see from the chart, the gap between the total amount of energy that fossil fuels will be able to deliver and the assumed rate of growth in energy use in the short term, 15-20 years, can be filled by alternative energy sources such as solar and wind, no problems there. But what happens afterwards (2055), when the equivalent of 100% of the 2030 fossil fuel energy will have to be replaced by other means, should concern us all. It’s not as if solar and wind are not able to deliver energy, they are sources of electricity; however, that’s the problem, we need to figure out how to substitute oil used for transportation – electricity needs are easy, or at least easier. Sure, we have electric cars, and their numbers are expanding, but what about running our ships and planes on electricity? World shipping and air transport are the backbone of our current world economy, without them, we don’t have a world economy. According to a Citibank report in February 2016, in partnership with the University of Oxford, 47% of US jobs are at risk from automation. In the UK, it’s 35%, and in China, (home to a quarter of the world’s population) it’s a whopping 77%, while across the OECD it’s an average of 57%. This massive loss of jobs will be precipitated by a second wave of automation, one that is centered on artificial cognition, cheap sensors, machine learning, and distributed smart networks, explains Kevin Kelly in his book The Inevitable. If you’re old enough to remember how the first wave of automation in the mid-20th century decimated working-class jobs in traditional manufacturing, you can easily imagine the impact the dawn of artificial intelligence may have on the middle classes. Currently, most at risk are low-skilled service jobs such as call centers or in manufacturing industries, but increasingly, skilled jobs are at risk of being replaced. Robots will initially replace assembly line workers, then workers in warehouses… Of course, fruit and vegetable picking will continue to be robotized until no humans pick outside of specialty farms. All the while, robots will continue their migration into white-collar work – the law, medicine, the financial services – anything repetitive and dependent on a learned set of skills is at risk. But, Steven Hawking also highlights a bigger issue associated with the explosion of robotics and automation in the workplace – acceleration of the already marked global economic inequality. You see, although automation and robotics will bring advances and benefits to people, only a select few will actually profit from this. Shareholders, top earners, and the well educated will enjoy most of the benefits that come from increased corporate productivity and a demand for technical, highly skilled roles. Meanwhile, the majority of society, namely the middle classes and, in particular, the poor will experience significant upheaval with few direct benefits. 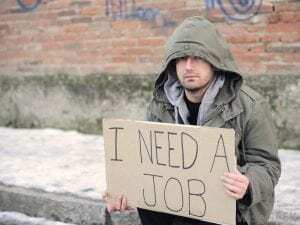 Between being forced to retrain and relocate and the obvious ramifications of mass unemployment, progress will be especially destructive for them. In a world where now the world’s eight richest people now have the same wealth as the poorest 50%, we can expect that essentially, very small groups of individuals will end up being the machine owners, making unimaginable profits while employing very few people. In 2015, our world leaders met in Paris in an effort to prevent, or at least slow down, the worst effects of climate change. They collectively signed an agreement that is supposed to cap the temperature rise in the coming decades at 2°C. 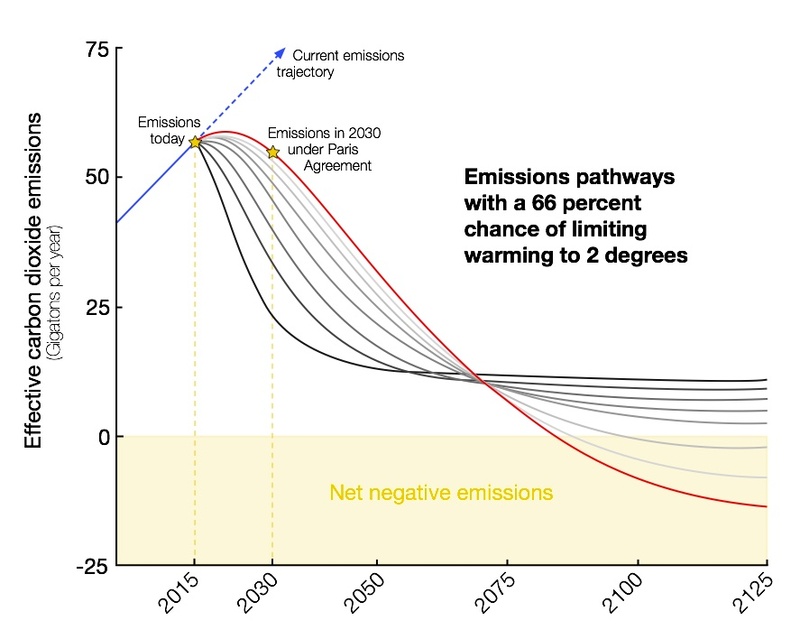 Assuming that we take immediate and dramatic emissions curbs, this is the best-case scenario we can hope for. Although 2°C sounds like a small uptick, the implications are profound. According to Eric Toensmeier in his book The Carbon Farming Solution, this best-case scenario is already disastrous for much of the world. For low-lying island nations and much of Africa, 2°C is nothing short of catastrophic. Moreover, the 2°C threshold is the point where these climate consequences are supposedly acceptable, but in reality we’re failing to even come close to this goal. If we were serious about change, we should be intensively electrifying the transport system, stopping the deforestation and building new coal plants and making carbon farming the only way to farm. Our current actions simply don’t reflect the necessary change, so it’s not surprising that we’re presently on a trajectory to a 6°C rise by the end of the century. But all of this is looking long term, we humans are not hardwired to respond to long-term threats. There are many uncertainties when it comes to predicting how long the effects will take to take root, as climate science is a complex beast. 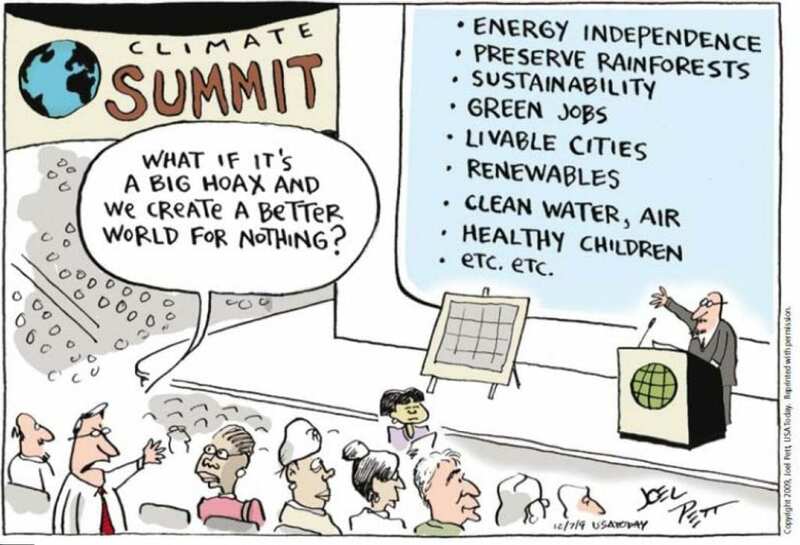 Additionally, it’s not clear how we’ll react to all these challenges, maybe with a global carbon tax, or a massive infrastructure investment in adaptation, or perhaps with a widespread geoengineering project. Because warmer air holds more moisture, there will be not only more storms, but also stronger ones, so we can certainly expect more Hurricane Katrina-type events. 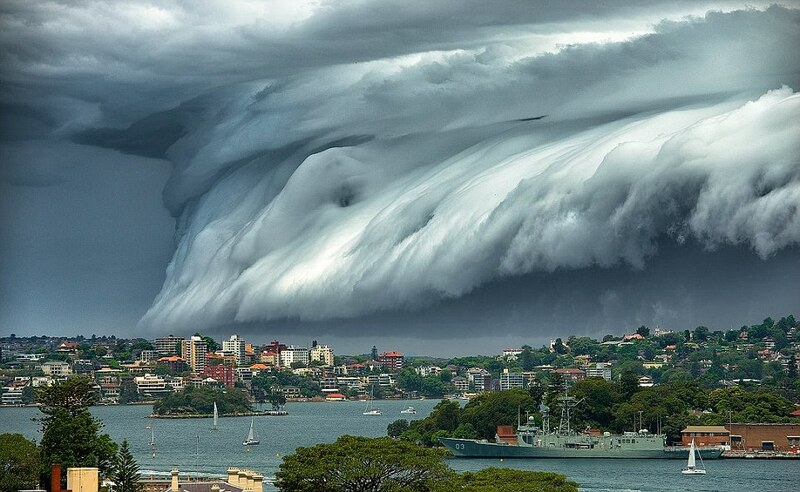 Rainfall is likely to be increasingly in the form of intense storms, causing flash floods and poor infiltration. These storms are also likely to affect regions that have not previously experienced them. All in all, in this weather weirding, some regions of the world are going to become much drier, while others significantly more humid. Among everything I’ve touched on today, it’s finance that we should be most concerned about in the short term. You see, the vast majority of people are not even aware that, beginning in 2008, we’ve been running the greatest experiment with money ever, one completely unprecedented in the 3000 or so years since its first appearance. We have 22 central banks simultaneously taking interest rates to zero and pumping the largest amount of money ever created into the economy, trying to stop it from collapsing. According to Ray Dalio, founder of the largest hedge fund on the planet, and one of the most knowledgeable and influential experts in this field, the chain of events that will precipitate the collapse of the banking system is largely predictable. You see, borrowing credit (and this is what now powers most modern economies) sets in motion mechanical, predictable and unavoidable events. This is because borrowing is simply a way of pulling spending forward, essentially you are borrowing from your future self and, in so doing, there is a time in the future where you’ll need to spend less than you make in order to pay it back. 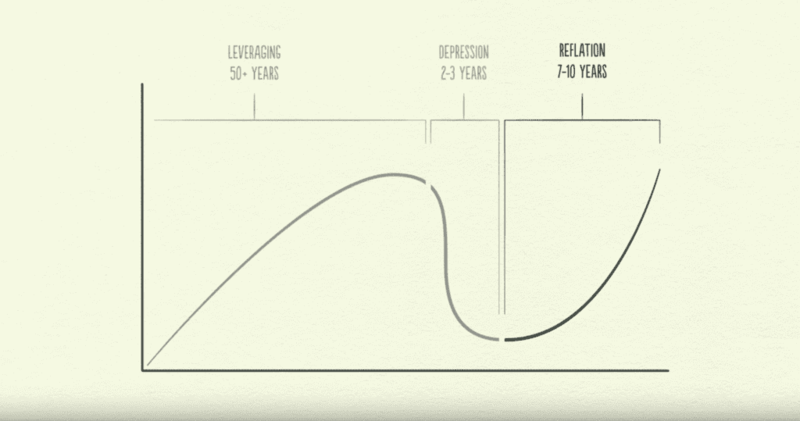 This creates predictable debt cycles, one that takes about 5-8 years and other 75 – 100 years. The short-term debt cycles are well known but soon forgotten, (people might now only vaguely remember an economic contraction of 2008) but it’s the long-term debt cycle – the one beyond living memory – that’s about to reverse itself in the biggest deleveraging since the Great Depression. 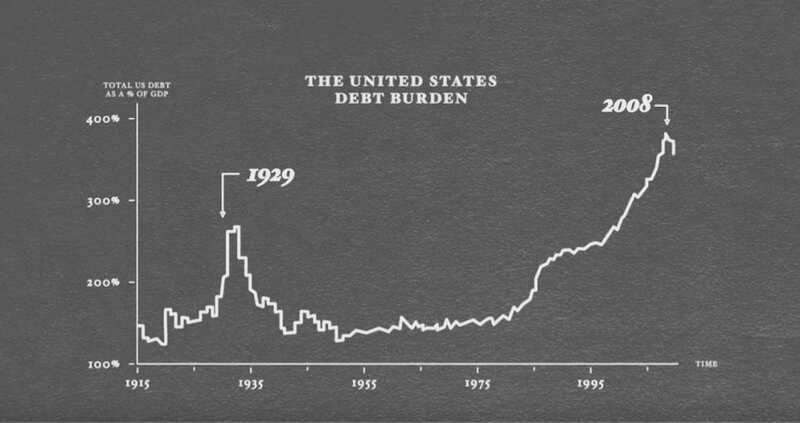 Over the decades, our global economy has been slowly increasing debt burdens, creating larger and larger debt repayments, and this simply can’t last indefinitely. With debt growing faster than income, banks f lending credit like greedy monsters, more spending, more buying, more borrowing, and so on, we have created the largest economic bubble in history and now we can expect a very significant aftermath. And it’s not a question of whether this deleveraging will happen, the main question is when and how it’s going to play out over the coming years. What we know is that all economic bubbles follow the same trajectory, explains Chris Martenson in his book The Crash Course: “a rapid contraction as credit evaporates followed by a long sustained contraction, where asset values decline to lower levels than at the beginning of the bubble.” This period might look and feel similar to the last financial crisis, but this time it’s going to be much, much worse. It will be qualitatively different and it will encompass multiple asset classes on a global scale. Since the interest rates this time are already close to zero and have been there for a while, lowering interest rates again obviously won’t work, so some sort of cut spending (more austerity), debt restructuring (defaulting), wealth distribution (can’t wait) and printing money (please don’t) will have to be employed to get us out of this mess. My research leads me to believe that we’re just one financial panic away from some serious changes to our daily lives. There are energy, technology and environmental challenges ahead, in both the short- and long-term but it’s through the economy that the repercussions of these future shocks will be most evident. The financial panic might not only be triggered by something coming from inside the financial system, but also by geopolitical events (conventional wars, cyberwars, assassinations, power grid outages, and terror attacks) and natural disasters such as earthquakes, volcanic eruptions, tsunamis, category-five hurricanes, and deadly epidemics. It’s true that all these factors have been always with us but, in our heavily indebted society, the status quo has never appeared so fragile. Our global economy is vulnerable to various degrees of economic and technological specialization, along with the growth of just-in-time logistics: all of which increase the chances of some kind of a large-scale systemic failure. The global financial crisis might well be the first of these crises that will cause a paradigm shift in our world. With the collapse of credit, it will also be very difficult to raise the finances necessary for the ongoing extraction of tar sand, shale gas and all the other unworkable resource extraction projects. This, in turn, could lead to a long-term fall in a societal complexity and Energy Descent scenario that David Holmgren believes we’re already in. Consequently, the overall sophistication of a society goes down: with less money in the economy and more expensive energy, specialisation goes away and division of labor breaks down, thus the whole economy becomes more labor intensive. Furthermore, the material standard of living and quality and quantity of goods becomes significantly and noticeably reduced for most citizens. In tough times, literacy becomes less widespread, thus people start to discard culture, philosophy, knowledge and learning. Time horizons start to shrink as daily concerns about survival prevail over long-term planning. Environmental concerns are relegated, as surviving the current month becomes a top priority. People who find themselves hit by effects of a crisis, whether caused by climate change, natural disasters, conflict, economic troubles or, more likely, a combination of the above, decide that the best option is to leave the crisis-hit area. Generally, the rural areas are impacted the earliest, with economic contraction manifesting itself there first (no jobs) and, with the withdrawal of government-supported services, rates of urbanization increase. Economic shocks, poverty, mass migration and strains on resources all provide fertile ground for conflict. In difficult times raising tensions between the have and have-nots, newcomers and natives amplified by the scarcity of resources easily end up in violence and wars. Both natural disasters and economic crises place enormous pressures on the normal functioning of societies. Consequences of chaotic weather, food supply problems, high unemployment, and the mass migration of economic and climate refugees all lead to a greater need, and support, for large-scale government intervention. The political system inevitably becomes fascist as state and corporate powers merge in response to increasing disorder. In this so-called corporativism, the police state and large corporations join forces to control the masses: small business owners, the workers, the pensioners, all while indoctrinating the children. More government will almost certainly not make people happier, as most will have a hard time accepting governments regulating every aspect of their lives. This is especially true when ordinary people realize how much wealth is concentrated in the hands of the governing elite or how much corruption is taking place at the high levels of central control. The people will, of course, rise up against this kind of injustice and corruption, and with the hungry stomachs, peaceful protests easily turn into riots. This revolt by civil society is always met by further repression by the newly emerged fascist state that is trying to keep everything in order and keep the ruling elite safe from the clutches of the mob. Now, I know you are probably thinking that you have never read so much fearmongering in one place before, but I’m about to prove to you that everything I said is real. All the challenges in energy, technology, environment, economy and socio-political changes are already here. You see, fascism is not in our future, it is here now. We’re already seeing the rise of fascist states. 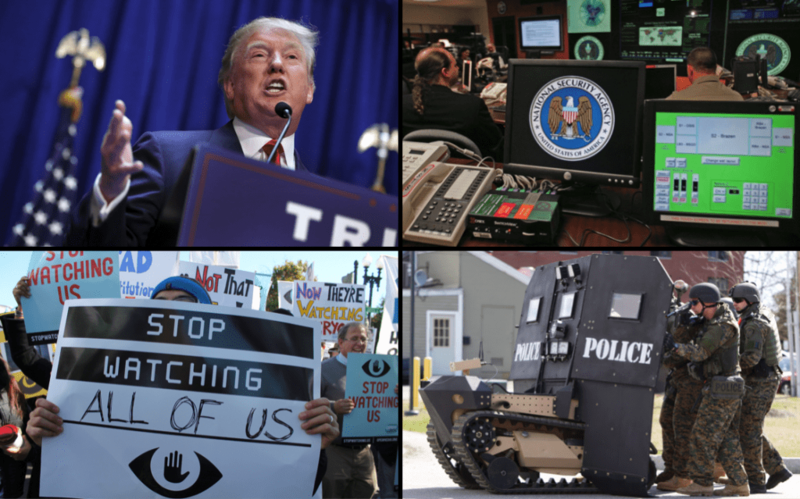 Take the US as an example; the US has developed into a country in which a militarized police with body armor, automatic weapons, armored vehicles, sound cannons, and other equipment designed for urban warfare is being used against its citizens. 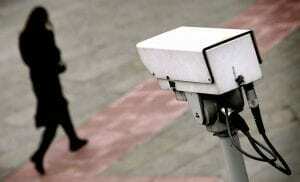 This is aided by the NSA program and high-tech surveillance technologies such as Facebook, Google, smartphone apps, face recognition software, etc. – check the terms and conditions of your apps and social media if this seems far-fetched. 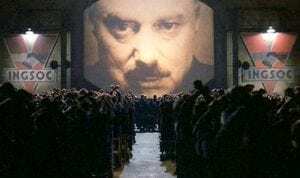 The government of the ‘freest country in the world’ now has an unprecedented ability to control and monitor its citizens. In our technology sector, we can also see that automatization is already here. In more developed countries, people are now beginning to lose their jobs due to this fourth industrial revolution. What do you think those self-service checkouts in supermarkets or self-order machines in McDonalds are? 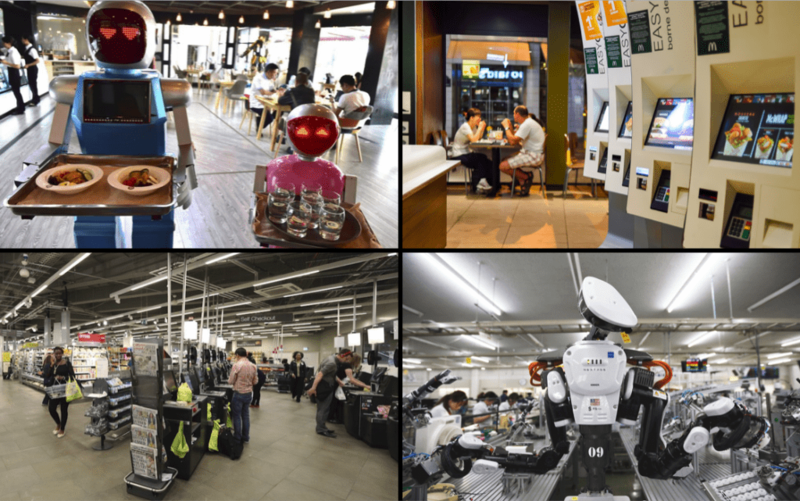 We’re already seeing intelligent robots working back to back with other manufacturing workers in Japan, or lending a helping hand in Chinese restaurants. 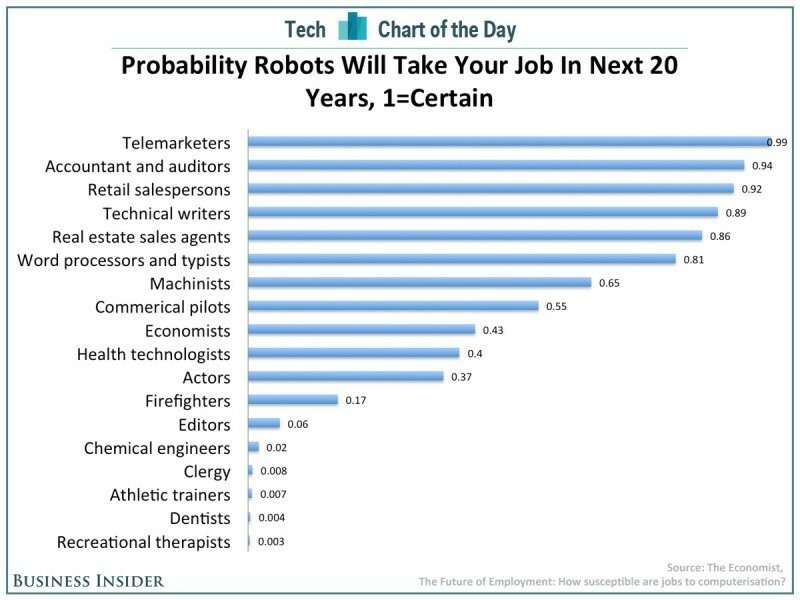 White collar jobs are also being increasingly automated, with the rise of robo-advisors, banks where the staff are primarily there to show the customers how to use the ATMs and life insurance AI systems, we can be certain that things are gaining momentum…The jobs that are gone are never coming back, so ask yourself, how safe is your job? 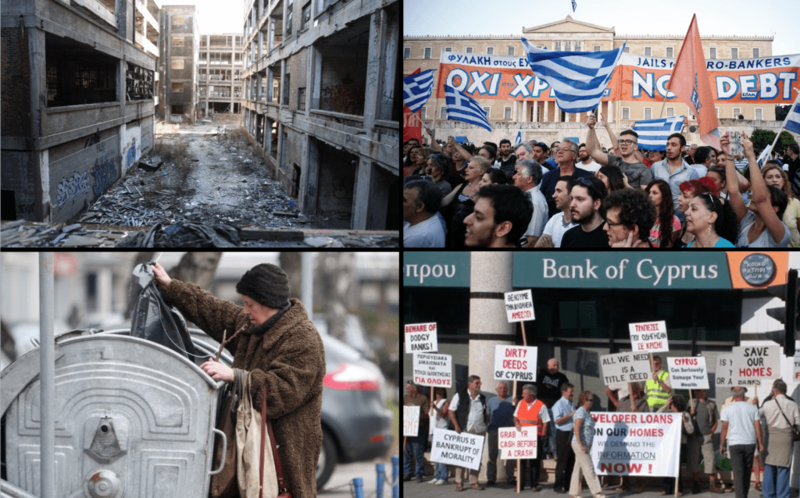 In many parts of the world, deep and almost inescapable economic crisis is already a daily reality for many. 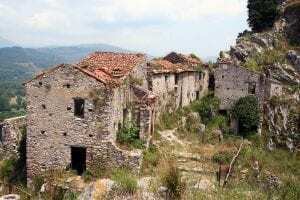 We can see economic ‘collapse’ already happening in Greece, other EU countries such as Croatia where I live and even certain areas of the US. Most people think in terms of the US as a whole, and sure the US economy is fine on paper, but the reality is that ‘American rust belt’ has been in collapse since 60-ties, 70 ties, for decades in decline. Climate change consequences are already felt around the world, but again they’re not evenly distributed. Corals are already bleaching, tornados are appearing in the Adriatic, where they’ve never been before, 100-year floods in Europe are becoming the norm rather than, as their name suggests, a rare exception. 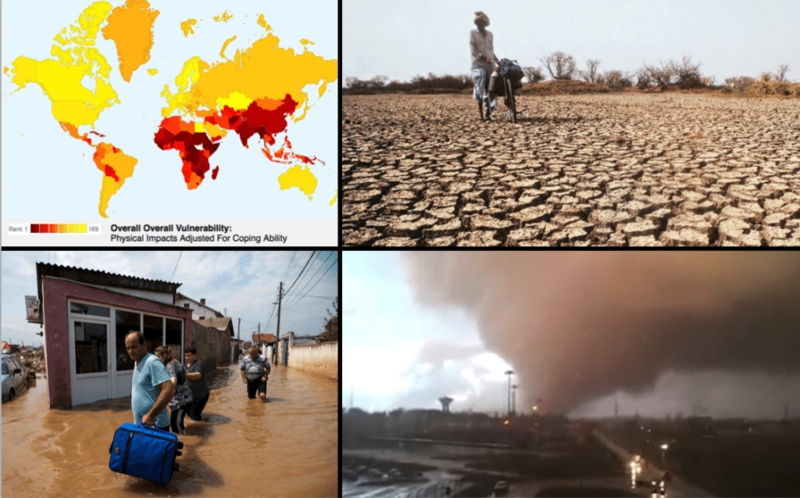 Climate change is already catastrophic for the Global South, where people suffer the consequences of climate change to a much greater degree than in the developed world, who are better able to cope with the weather extremes. Overall, risks of climate change are unevenly distributed and, given that the poorest have the worst housing, and tend to live in areas prone to hostile conditions, are generally greater for disadvantaged people and communities in countries across all levels of development. Now, I know that, taken individually, these crises don’t suggest that our global civilization is collapsing or even that it’s in decline, but looking at the big picture, the dynamic playing out is a sure sign that huge changes are imminent. You see, how vulnerable you are to anything outlined above depends on how dependent you are on the current system. The greater the dependence, the more negative the consequences for you. That’s why you need to build your own parallel system and improve your self-reliance and resilience. Central systems might fail but they won’t do so overnight, they’ll simply become less effective in delivering goods and services that you rely on with each passing year – this is what you need to be prepared for. There has never been a better time for those of us looking for solutions and with the courage and drive to put them into action. We have all these great tools and technologies on our disposal, and the individual is becoming more and more empowered. Today, knowledge is free and easily accessible, we have all this amazing capability to organize and collaborate, from crowdfunding to open source. On a household level, we’ll all benefit from the automatization of gardening, 3D printers offering anything we want and new better batteries and solar roofs to lessen our dependence on energy. 1. Location and community – we need each other to get through this. Humans are social creatures and we need community interaction. We also all have different strengths and areas of expertise that we will benefit from sharing. Local communities can provide different ways of wellbeing and, by so doing, can compensate for the collapse of the centralized system. 2. Water – is an essential nutrient for plants, humans and animals alike, nothing can grow without water and nothing defines a permaculture farm more than water availability. In a changing climate you might have too much or too little, so that’s why you need to develop systems able to catch, store and distribute water with ponds, tanks, drains and irrigation pipes. 3. Infrastructure – built elements are as important as natural ones. Building of core infrastructure (access, structures, fences), off-grid energy systems and the acquisition of quality tools and equipment should all contribute to achieving the optimal use of resources and energy. 4. 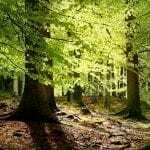 Living systems – annual gardens, permaculture orchards, food forests, animals. It is the growing of food that is the main focus of permaculture. By providing for our needs, we’re also performing the necessary restoration of damaged ecosystems and contributing to the amelioration of climate change. 5. Farm economy – the best way to achieve your freedom and create the life you want is by doing something aligned with your values and making a living out of it. 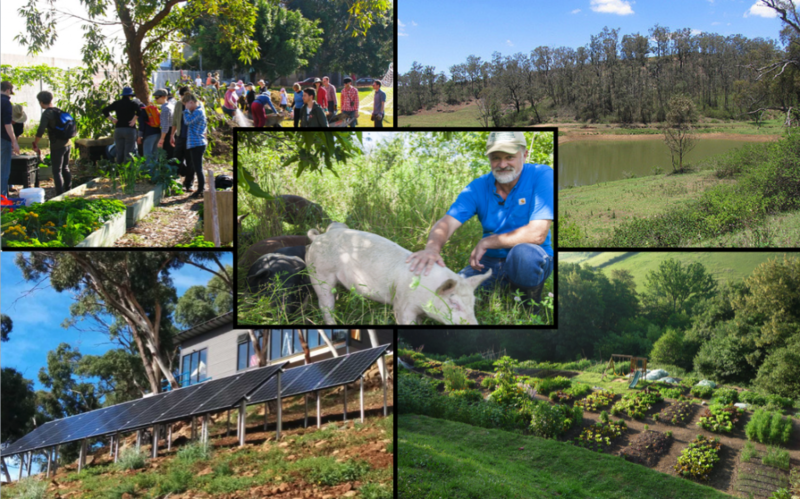 On a permaculture farm, there are many opportunities to develop multiple income streams and sustain yourself in a meaningful and resilient way. I’ll be explaining how to set up these systems in details on my blog, so be sure to subscribe to my newsletter if you haven’t already! You don’t even have to believe me that any of the particular scenarios outlined are upon us to make a serious adjustment to your life, in the same way, you don’t expect that your house will burn down but will still have home insurance. The risks are disproportional, if something catastrophic takes place and you’re unprepared, you risk everything. 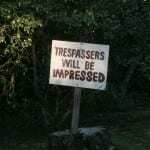 If, in contrast, you’re prepared, you’ll end up having a better life whatever happens. Even if I’m totally wrong about everything and you go to all the trouble of buying a farm, setting it up, growing your food, and earning an income from it, I’m confident to say that this will never be a bad investment of your time, money and energy. You’ll never look back and regret all the abundance and quality of life you created for yourself. I’ll be honest, and admit I’m troubled and increasingly worried with each passing day with what’s happening in our world, but I choose to do something about it on a daily basis. What about you? Leave a comment in the comments section below!